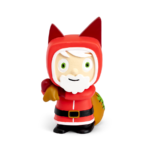 Category: Hope House Press, Gift Ideas, Stationery & Cards. 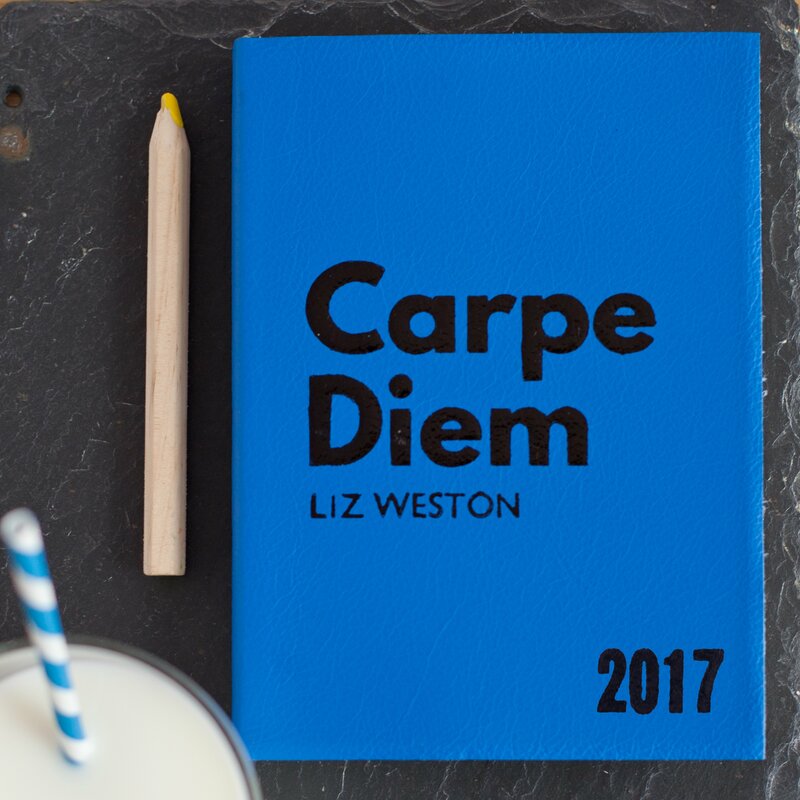 Carpe Diem is a already a Hope House Press Modern Classic – freshly inked with classic motivation – act now – seize the day! Carpe Diem is an iconic phrase in its own right. Now that we’ve added it to our legendary luxury leather Notebooks, Journals and Diaries, this style has become our quickest selling new piece. The font feels as though it leaps out from the cover and compells the holder to seize the day. 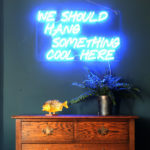 We love the idea of this being gifted to a new graduate, an adventurer going travelling or a grandparent taking retirement and taking on new challenges. Carpe Diem feels like it is truly a ‘Cradle to Grave’ style because it will work at, and for, any stage of life. We’ve already had feedback from one customer who gifted it to a friend post divorce and starting over. What a vote of confidence to receive from someone who cares about you…. Whether bought as a Notebook / undated Journal with plain, lined or squared paper, you can choose to annotate the first page with a message of your own support, or give as an example of a blank template, ready for the taking. When you choose a Hope House Press piece you’re in good company – our diaries have a cult celebrity following and a history of being selected for Tatler’s Top 10 – we’re quietly confident that this will make the list for 2017. Each Hope House Press Notebook, Journal or Diary is made by hand to order in our studio, from good quality paper bound in luxurious Italian leather. The natural materials and traditional print method make each one unique. Our signature print method produces a ‘kiss’ with ink, rather than an impression in the leather. For the line of smaller personalised text, we have room to print a maximum of 14 characters including any spaces and punctuation on the Medium (Between A6 and A5) notebook, and up to 16 characters on the Large (A5) sized notebook. You can choose from a range of bright, muted and classic luxury, leather, colours as indicated in the drop down menu. To make this style truly bespoke, you can also choose to have an undated Notebook / Journal in a plain, lined or squared paper format. All of these formats are shown in the images alongside the cover of this style. Hope House Press is renowned for our attention to detail – there is as much delight in opening our products as there is in using them. Every order is beautifully gift wrapped as standard: The notebook arrives presented in a gift box lined with tissue and secured with a band of ribbon, and includes a gift card printed with your message. It is ready to gift, without further wrapping required – making it perfect if you’d like us to send it direct to the recipient. If you would like us to send it direct to a recipient for you, we’d be happy to also include a notecard with a message of your choice – we’ll print it and pop it underneath the ribbon for you, at no extra cost. Carpe Diem is available in the following sizes: Medium (between A6 and A5): bound size approx 17 x 12.5cm. Contains 144 pages/288 sides of paper. (This is our best selling notebook size, because it works perfectly whether kept on a desk or stashed in a handbag). Large (A5): bound size approx 21.5 x 15cm. Contains 144 pages/288 sides of paper. We understand it can be difficult to gauge the dimensions of a product from images when shopping online. As we’re unable to offer refunds or exchanges for personalised products, we advise checking the measurements stated above before ordering, to confirm you’re happy with the size. Hope House Press has been shortlisted twice in the Not on the High Street MAKE Awards – Best Customer Service (2011) and Community Ambassador of the Year (2013). Carpe Diem is a already a Hope House Press Modern Classic at Design Essentials – freshly inked with classic motivation – act now – seize the day! When you choose a Hope House Press piece you’re in good company – the diaries have a cult celebrity following and a history of being selected for Tatler’s Top 10 – we’re quietly confident that this will make the list for 2017. For the line of smaller personalised text, we have room to print a maximum of 16 characters including any spaces and punctuation on the Large (A5) sized notebook. 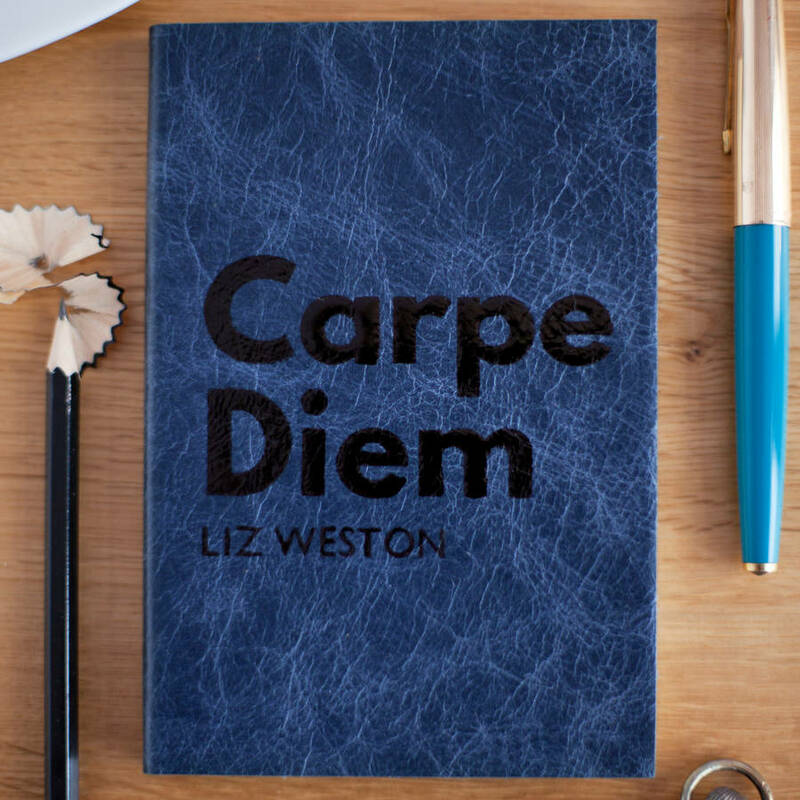 Carpe Diem is available in the following size: Large (A5): bound size approx 21.5 x 15cm. Contains 144 pages/288 sides of paper. 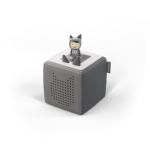 We understand it can be difficult to gauge the dimensions of a product from images when shopping online. As we’re unable to offer refunds or exchanges for personalised products, we advise checking the measurements stated above before ordering, to confirm you’re happy with the size. Pop in to our shop located in Saffron Walden should you wish to see the amazing quality and work on offer. Alternatively feel free to call us on 01799 522417 to discuss. As always we like to showcase great products at Design Essentials and Hope House Press has been shortlisted twice in the Not on the High Street MAKE Awards – Best Customer Service (2011) and Community Ambassador of the Year (2013).